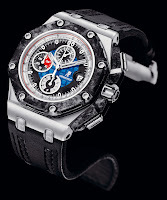 The Royal Oak Offshore Grand Prix Collection embodies the powerful ties between watchmaking and automobiles: the same passion for design and the same incessant quest for mechanical performance. The dial counters evoke dashboard instruments, the crown a gear, and the bezel a ventilated brake disc. This collection is composed of three timepieces, issued in limited series featuring meticulously executed details combined with cutting-edge materials. These models are powered by a throbbing engine in the shape of a selfwinding proprietary chronograph movement and are sure to delight all those with a taste for high-speed thrills! Whether viewed from the front, the side, or through the sapphire crystal back, all angles provide the same clear-cut impression of dynamic, aggressive, taut and complex shapes that are undeniably reminiscent of gleaming automobile bodywork. Among the three interpretations available, the first is distinguished by a forged carbon case matching a bezel with a forged carbon upper part and a lower ring in shimmering black ceramics. Offering a perfect example of the sophisticated design of this collection, the bezels are composed of two openworked and nested rings. The screws extend slightly beyond the bezel surface and are thus set off to their best advantage. This first version radiates an extremely sporty and predominantly black appearance enhanced by the red dial – a central eloxed aluminium plate adorned with the “Méga Tapisserie” motif characteristic of the Royal Oak Offshore line. The pattern has however been specially revisited for this limited edition by means of a negative-printed design that creates a depth effect and evokes the cooling scoops on a car. Another red accent appears on the crown adorned with an eloxed aluminium cartridge. The crown deserves a closer look due to its sophisticated edging and its openworked design providing glimpses of red – a colour that also appears on the side of the alcantara strap. The floating flange stands out because of its bronze colour reminiscent of the magnesium alloy wheel rims on a racing car. 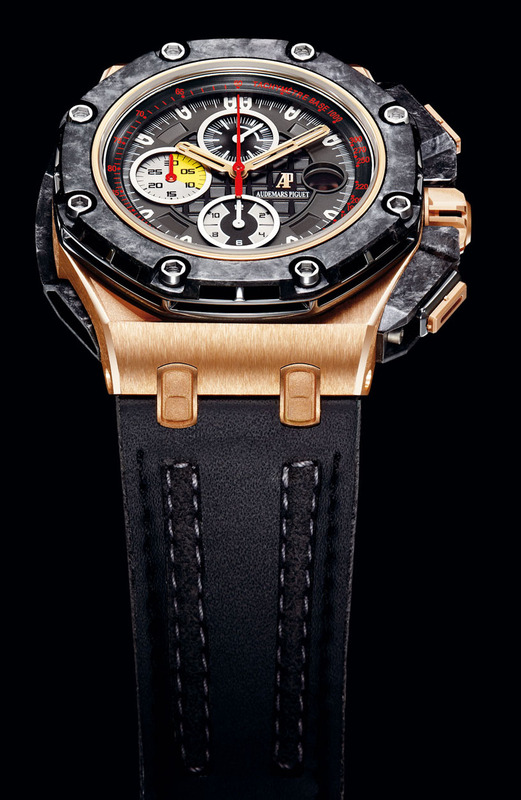 The second interpretation has a case in pink gold, a noble material that makes a striking contrast with the forged carbon and black ceramic bezel, as well as with the left side of the case middle and its forged carbon element designed like a ventilation duct. It also contrasts with the carbon pushpiece guards, which further exemplify the meticulous detailing on this model. Instead of being straightforward rectangles, the latter feature clean-cut high-tech edges and are applied to the case by four visible screws as well as hollowed on the side so as to house the pushpieces which are themselves composed of two parts: a black polished ceramic base and a pink gold contact surface. The third and final version also has a forged carbon and black ceramic bezel, fitted on this particular model to a case in 950 platinum – the ultimate noble metal that is teamed with a blue eloxed aluminium dial plate. This fascinating list of technical and aesthetic characteristics would hardly be complete without mentioning the four scoops at 1.30, 4.30, 7.30 and 10.30, echoing the studs which pick up the same theme; and the three counters with a raised rim that is blackened inside and polished on top. 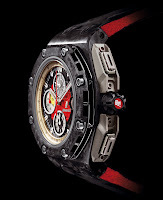 While racing cars are naturally powered by high-performance engines, the movement equipping the Royal Oak Offshore Grand Prix chronographs is equally impressive. The selfwinding Calibre 3126 is entirely designed, developed and made by the Manufacture Audemars Piguet, and the 3840 chronograph mechanism with which it is fitted ensures accurate timing. The constantly enhanced Calibre 3126/3840 is distinguished by its admirable reliability. Its cross-through balance-bridge guarantees improved shock-resistance, while the variable-inertia balance equipped with eight inertia-blocks ensures stable long-term constancy of rate. It is also extremely user-friendly, particularly thanks to the fast-adjustment instant-jump date display and the 60-hour power reserve. Accurate time-setting is facilitated by the fact that pulling out the crown instantly activates the stop seconds lever which – as its name implies – brings the seconds hand to an immediate halt. But the most stunning assets of Calibre 3126/3840 undoubtedly lie in its refined design and the fine workmanship it embodies. 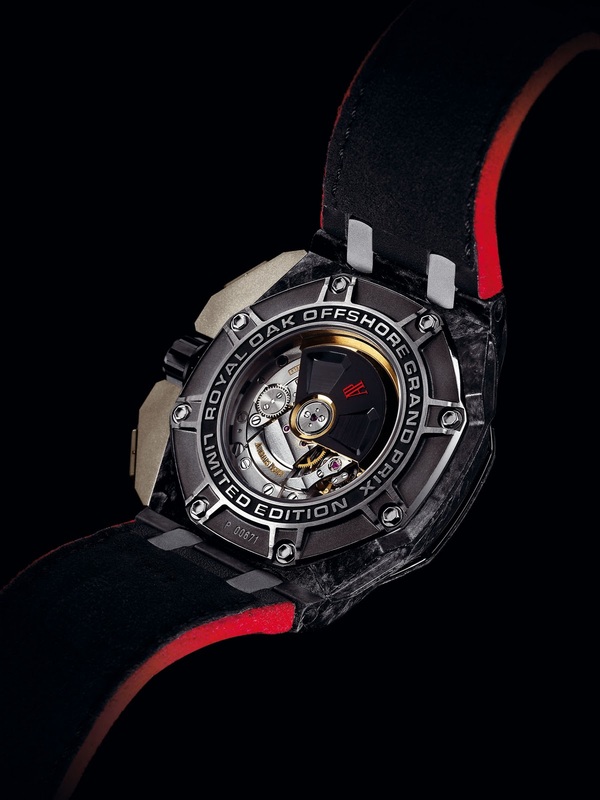 Hand-assembled in Le Brassus workshops, it boasts exceptional quality of execution and finishing. The bridges, which are arranged in an elegant and harmonious manner, are meticulously chamfered and polished so as to display only clean-cut, shining edges. The jewel sinks are diamond-polished and the wheels feature chamfered arms and diamond-polished sinks. Even the screw slots and rims are chamfered. The hand-crafted decorative touches include circular-grained on either side of the mainplate and bridges adorned with Côtes de Genève. The single-piece oscillating weight in 22-carat gold has been specifically designed and developed for this prestigious limited edition. Partially blackened and hollowed, it reflects the recurrent theme of scoops and contrasting relief effects. 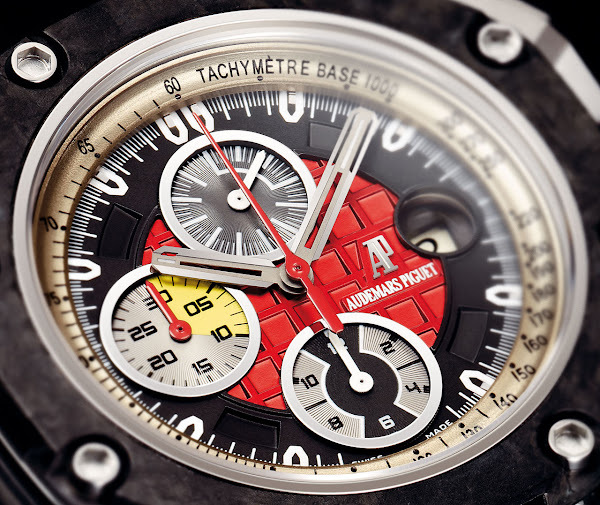 The AP monogram – naturally in red – is thus framed by two scoops carved out of the metal block. The case-back comes in titanium, pink gold or 950 platinum according to the version and matches the overall resolutely modern and industrial aesthetic. It alternates between grained, satin-brushed and polished finishes and shows off its eight hollowed screws. A circular zone dedicated to a partially blackened text zone proudly displays the inscription “Royal Oak Offshore Grand Prix Limited Edition”, while the central sapphire crystal enables one to admire the magnificent motor driving it. Forged carbon was deliberately chosen for this collection. 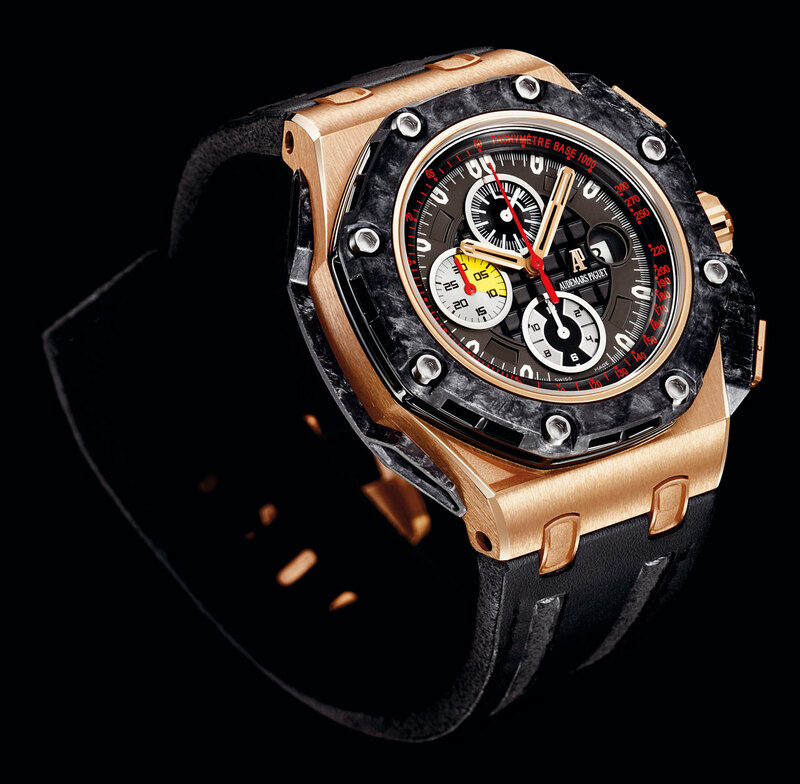 This ultra-light and resistant material is exclusively developed by Audemars Piguet, from the manufacturing method through to the related tools. 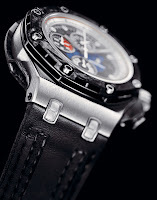 The sophisticated shapes of the Royal Oak Offshore are achieved thanks to an appropriate mould. A set of threaded carbon filaments is placed inside this mould. This wire measuring just one millimetre in diameter is itself composed of several thousand 7-micron carbon fibres held together by a resin wire. The case middle of the Royal Oak Offshore Grand Prix calls for a set of filaments totalling 12.5 grams. Placed end to end, these filaments are equivalent to 22.2 metres of carbon wire and 99.7 km of carbon fibres! The mould is then compressed at high temperature at pressures of over 300 kilos per square centimetre. This process results in a material composed of 76% carbon and only 24% polyamide. Audemars Piguet displays the full force of its expertise in the machining process. The inside of the case and the correction of the various drilled holes can thus be meticulously finished. The result is a shimmering effect and a silky feel, clear-cut edges and a sturdy yet ultra-light case-middle: in its forged carbon version, the Royal Oak Ofshore Grand Prix weighs a mere 120 grams! Ceramics, blackened or beadblasted titanium, eloxed aluminium, 950 platinum and pink gold all contribute to this stunning combination of sophisticated materials. Black calfskin and alcantara, hand-sewn with alcantara inserts and edges, pin buckle in beadblasted titanium, or 18-carat pink gold or 950 platinum.